David Cameron has rejected an appeal to give the NHS more money based on the leave campaign’s pledge to put £350m a week into the service, even though the referendum revealed strong public backing for the move. The British Medical Association had asked the prime minister to increase the health budget by even more than the £10bn already planned, given the referendum result. In a letter to Cameron last week, Dr Mark Porter, the BMA’s chair of council, said that pro-Brexit campaigners’ promise of putting an extra £350m a week into the NHS – displayed prominently on the Vote Leave battlebus – “appeared fanciful at the time but the speed in which this commitment was reneged upon and proven to be a lie to the British public is a truly shameful state of affairs”. However, Porter added: “With such a prominent campaign message proving to be successful at the ballot box, what cannot be disputed is the public’s eagerness to see increased funding for the NHS. “The BMA calls on the government to make good on the promise made to the British public, and give the NHS the funding which it requires so that doctors can provide the service for patients which they deserve,” he added. The Conservatives promised in last year’s election campaign to give the NHS in England £8bn more by 2020-21 on top of the £2bn extra it got in 2015-16. Replying on the prime minister’s behalf at the weekend, Jeremy Hunt, the health secretary, admitted that the NHS is under strain but said Cameron’s successor would have to decide how much money it should receive. “This government has prioritised health and invested an extra £10bn in the NHS’s own plan for the future. We recognise parts of the NHS are under pressure as demand rises due to our ageing population, so we are providing intensive support to improve performance, boost efficiency and reduce the use of expensive agency staff,” said Hunt. “Any future decisions on further funding for the NHS are a matter for the next prime minister,” added Hunt, who had “seriously considered” running for the Conservative leadership but not did apply. In his letter, Hunt – a remain supporter – hinted that the NHS should still be able and would need to hire staff from EU countries once Britain has left the union, in response to Porter’s statement that “the NHS would be a poorer place” without staff from other EU states. “However they voted, the British people expect continuity and stability in public life – nowhere more so than in terms of our NHS, something we all depend on and the most highly valued and loved public service of all. 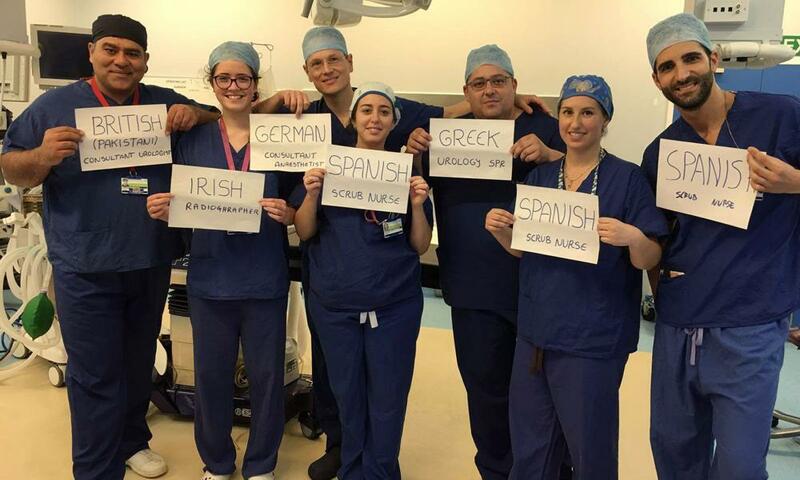 Ten per cent of our doctors, and more than 20,000 NHS nurses, are from another EU country, and we simply could not do without their contribution. “We all must now do everything we can to ensure our whole workforce feels secure because that is the only way we will ensure we can deliver high-quality care for all,” said Hunt. Meanwhile, a leading expert on social care has warned that Brexit could have a “frightening” impact on older and disabled people who rely on social care services, including the closure of care homes and problems recruiting care industry staff. “The care crisis will only get worse as the economy buckles. The consequences for older and disabled people and their families are frightening,” said Stephen Burke, director of the Good Care Guide. “Not only will they face squeezes on their own budgets as prices go up and jobs are lost, but they will be left to cope on their own and expected to pay for their care, provide it themselves or struggle without,” he wrote in a blog for the Huffington Post. Leaving the EU could exacerbate understaffing in the care sector, in which 80,000 of the 1.3 million-strong workforce come from EU countries, especially because of greater racist abuse since the referendum result, Burke said. “This inevitably will make some workers seriously consider whether they want to work in the UK and it will deter others from making the move here. Many nursing homes [already] cannot recruit the qualified nurses they need and incur large agency bills or tolerate potentially unsafe practices,” added Burke.